Yesterday I spent a day at a business workshop. Unsuprisingly I was the only Flower farmer there. I was asked, "How do you manage to do flowers in January when nothing flowers?" Ah, - I do feel so sorry for office based people, who don't get to really look, and see the beauty of winter flowers outside. So here is my debunking the myth that nothing flowers in January. I saw every single one of these on my travels today. - Admitidly, the photos aren't all from this year, as it was a dull and gloomy day, and I wasn't prepared to stand still enough to get decent pictures, but every single one of these is flowering in and around Horsley today the 30th January. That's not including the stray flowers in my garden that think it's March, - like the Kerria, the Hesperanthera, and the Campanula. Or the Cerinthe still blooming on the Allotment. Doesn't take into account the bulbs in my polytunnel which could be flowering now if i'd planted them 2 weeks earlier - the Hyacinths & crocus. - Or of course the lovely collection of English flowers which arrived from James at Clowance today, - Narssisus from the Isles of Scilly, Tulips and Alstroemerias from Lincolnshire, and Anemones from Cornwall. And I havn't even mentioned the foliage, - the Eucalyptus, Cornus, Willow, Brachyglottis, Rosemary, Bay, Choisya. No........... Not a single flower in January.....Lots of flowers, and foliage and scent. English Cut Flowers are going to be big this year. - There's no-one that doesn't smile when presented with flowers, - so if you're planning to grow some of your own this year, - here are my top tips to get you started. It's January. It was bitterly cold on Hill top farm today, but Brides to be are thinking about their perfect day weddings in the summer, - So I need to be as well. When I started out on in flower farming, I went to a course at Common Farm Flowers. Georgie does the most fantastic wedding flowers, - She's an artisan florist, and I knew that how ever hard I tried, I couldn't do flowers like hers for weddings. I didn't really want to spend time learning to make fiddly buttonholes - BUT, I can grow a great Sweet pea, with long stems - encourage a Rose to smell amazing, Make rows of Ammi, Dill and Cerinthe fluff up as fillers, get Sunflowers to bloom when I want them to, and produce enough Cosmos, to cover a church. So I needed a florist. I've found one now. Someone whose style I love, Whose enthusiasm for English flowers is as large as mine, and who more importantly, has the past experience and floral training to make sure that they will be as dedicated to providing Quality flowers and service to Brides as I will, - meet Paula. - Yesterday we travelled to Cullompton in Devon, with 3 other Surrey Flower farmers to meet up with other #britishflowers growers at the Corn Barn. (a lovely 6 hours of chatting flowers, - thanks Sara, Fiona and Caroline) We came away having been informed, inspired and enthused, to promote our Grown not Flown flowers, to all the lovely Brides who get married in our patch of Surrey. We want Brides who want their flowers to smell great, to look wonderful, and who care that they havn't flown 4000 miles to get to the church. We've got 2 lovely ladies signed up already, and another 3 enquiries, - so how do I know what i'm going to have ready for them on their Special Day? Well the vageries of the English weather mean that nothing is a certainty. I havn't covered my Hillside with Polytunnels, and sprayed it to keep away weeds and pests. However. I've been taking photos of flowers in my garden and clients for years, so although i've only got 2013 to go on at Hill top farm, I can for instance say that at the end of May, - These will be looking good. Sage, or Lemon Balm, or Mint, or Basil (Thyme/Rosemary/Tarrogon/Geranium) as well as scented flowers, and will look as beautiful as these. I'm really excited about sharing my flowers, - So if you've got a wedding or an event coming up, - please come and talk to us and let us show you Hill Top Farm. 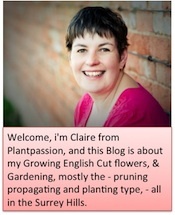 - I'm hoping you'll catch my love of #Britishflowers. It's Wet. - It seems to have rained almost every day since Christmas. But luckily for me Hill top farm is on a Chalky hill, and so it is soggy, but not flooded. It's mild though, and that means that things are still growing, particularly in the polytunnel. I only just cut back the last of the Alstroemerias for table decorations before Christmas, but they are pushing up through the ground again (top left) The Ranunculus (top right) and Anemones (bottom left) will be the first flowers to come this year (apart from the Paperwhite Narsissus which are doing really well and have been used all over Christmas in bouquets) and i've got plenty of Sweet peas coming. I'm trying Winter sweet peas for the first time, - which should flower late April/ Early May as they are varieties that are specially bred for shorter day length. Where at this time last year, we'd just cut the first seven beds into the field, we've got 17 beds of over wintering Annuals. Having learnt our lessons from last spring, We've covered them with either fleece or netting, so that the Rabbits and deer will have a harder job getting to them. I've also managed (with lots of family help again) to get a huge amount of weeding done. - The beds that we covered in organic compost last year, are so much easier to do than the rotavated ones, - We won't be using that piece of machinery again in a hurry. "Next Time you want to Brighten your home, Celebrate our Incredible Horticultural Heritage and buy UK grown Cut Flowers"
Enjoy, - i'm really looking forward to this season.